Courtney Crumrin’s adventures continue — this time in a newly remastered, full-color edition! Courtney and Uncle Aloysius’ European vacation has brought them into the heart of a country rich with mystical history and tradition. At first, eastern Europe seems like the perfect place for Courtney to strengthen her abilities, but just as Courtney begins to tap into the mystery of the old country, she comes face-to face-with overwhelming magic and even larger moral ambiguities. This book was a great continuation of the first three. I think this one has been my favorite so far because she gets into some trouble, but that causes some cool additions to the plot. It makes me sad that Courtney is lonely because she gets semi-depressed. I also must have missed something because I’m not really sure what the horrible thing her uncle did that made her not want to talk to him anymore. I thought they were friends. Idk. I liked that this took place away from the mansion and her parents. I don’t like her parents because they’re too focused on being fancy in the rich neighborhood. They don’t seem to care about her, so it’s nice she got to spend some time away from them. I wish that she was still buddy-buddy with her uncle because that would have made this story so much cuter. There was a lot more action throughout this graphic novel. There were some fights between a few different groups of people which added some suspense and mystery. I like that she befriended the vampire guy, but I wish he wouldn’t have turned on her. Sorry, not a huge spoiler. He seemed like a cool enough guy and it just made me sad that they couldn’t be friends. They both needed a friend. I’m sad because I don’t know how I’m going to get ahold of 5, 6, and 7 in this series. My library doesn’t have them, but I don’t like buying graphic novels because I read them so fast ugh. It’s a struggle being a book worm let me tell ya. 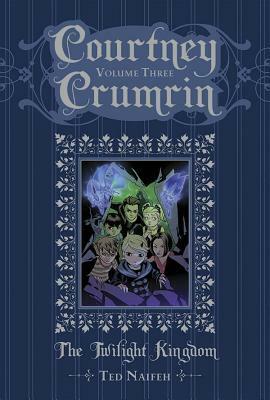 Courtney Crumrin returns in a series of newly remastered, full-color hardcover editions! To her new classmates, Courtney is merely the grim, quiet girl in the back row. But when a group of students accidentally turns a young boy into a goblin, Courtney must lead the children into Goblin Town to find a cure. Unfortunately, misfortune seems to follow the group straight to the Twilight Kingdom – misfortune and a misguided lawkeeper who has it out for Courtney! Courtney gets some new friends from her school filled with witches and magic and takes a trip to Goblin Town to try and change a classmate back into a human. The newly-founded friend group has to venture far into the forest in order to save the boy who has gotten turned into a goblin. They eventually find themselves in Twilight Kingdom where they end up in trouble with the law and have to fight there way back to their town. This one was just as good as the first one! There was action and an actual plot. Yay for plot-driven stories. I am really starting to enjoy Courtney more as a character. She’s spunky and sassy and a little mean, but I think she’s a solid character to have a series about. I’m so excited that she finally has a group of friends because now I don’t think she’s going to be so sad. She’s been so sad and lonely, so it’s nice to see her be a little happier. My favorite part of this book was right at the end when her uncle offered for her to travel with him this summer. Aww cute. Yay the horrible parents are back. Not yay in the sense that I like them in the story, but yay in the sense that they haven’t just randomly disappeared. In the last book they just were randomly gone, so I think it makes sense that they were back in the story this time. I didn’t like her friend Malcom from the beginning, I don’t really think he had anything important to do with the storyline so idk why he was even there. I’m sure that he’ll come up somehow in the rest of the series, but he just seemed like a very stagnant character. I really appreciate the art style because it’s so unique and the color scheme is so pretty. I love when the colors are more neutral but still fall into the darker side of cool colors. Theres a lot of green, purple, and blue so it feels very… cold and mysterious maybe? I’m not really sure but I think it complements the storyline nicely. I’m sad because my library only has the first four volumes of this series so I don’t know how I’m going to read 5, 6, and 7 :( #tragic. I’ll have to find them somewhere because I think I’m really going to want to finish this series! 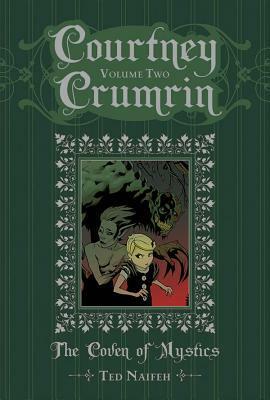 Fan-favorite and critical darling Courtney Crumrin is back in a series of newly remastered, full-color hardcover editions! When the night things of Courtney’s community start causing trouble, it’s up to the girl to find out why. The town’s powerful coven of mystics thinks it knows who to blame, but Uncle Aloysius doesn’t believe their simple explanation. His misgivings start Courtney down a twisted path that leads to the true mastermind behind all the horror! But does Courtney stand a chance against a being that powerful and manipulative? 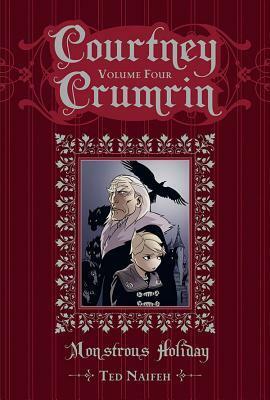 Book two of this dark fantasy graphic novel series. The Coven of Mysics follows Courtney Crumrin and her adventures with her Uncle Aloysius. This installment of the series shows Courtney being turned into a cute kitten, capturing an evil monster, and helping her Uncle through some scary events. The creature called Skarrow has been caught and is being hunted for cursing a local witch, but is he responsible? Why are the townspeople after him? Although I didn’t like her parents in the first book I think it’s a little unrealistic that they’re not even in this book now. You can’t just have side characters completely disappear without any explanation. Her parents were the whole reason she even moved in with her Uncle in the first place, so I think their disappearance should have been explained a little bit. I enjoyed this one less than the first because less happened in this book. There wasn’t as much plot or adventure in this one as compared to the first. I still think it’s very strange that she isn’t drawn with a nose. I just want to know why if there is a reason. lol why does everyone else have a nose, but the main character doesn’t? hmm. The whole story followed Courtney trying to help this creature called a Skarrow. He has been wrongly accused of cursing the most beautiful witch in the town, but he didn’t do it. Courtney is trying to help him and prove to the town that he’s innocent, but then the woman who was cursed doesn’t turn out to be on her side even though she loved the Skarrow. Triggered. How is that okay? You can’t just leave a helpless creature to get attacked and die just because you’re not willing to speak up. I have a question. Why are there so many witches and warlocks in this town, and how do the non-magical people not know about them. If there are so many there has to be a specific reason. Is it because of the Coven that’s in the town? Even though I didn’t like this one as much as the first I am still looking forward to reading the next ones! 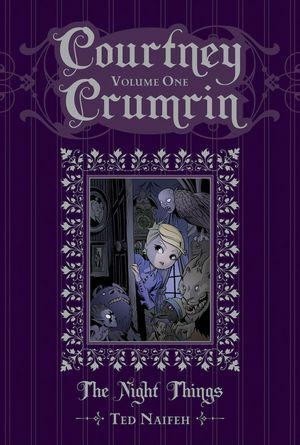 Fan-favorite and critical darling Courtney Crumrin is back in a series of newly remastered, full-color hardcover editions! Courtney’s parents have dragged her out to a high-to-do suburb to live with her creepy Great Uncle Aloysius in his spooky old house. She’s not only the new kid in school, but also discovers strange things lurking under her bed! 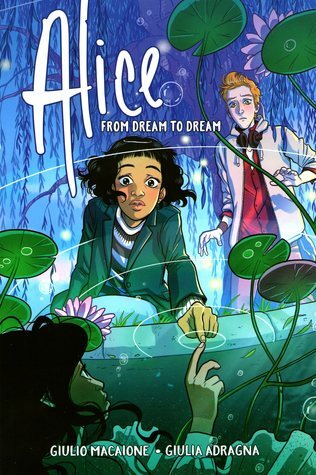 I went to my public library to do some studying for class and of course couldn’t leave without perusing the shelves… I wanted something fast and fun, so I chose this graphic novel. I thought the art style would be super cute and it looked a little creepy, so I decided to go for it, and I was not disappointed! This graphic novel follows a girl named Courtney Crumrin moves into her great-uncle’s house with her parents in order to take care of him. Her parents are obsessed with the idea of moving up in society and being part of the popular crowd, so she starts to connect with her “creepy” uncle Aloysius instead of fostering a relationship with her parents. She now lives in the only creepy house in the whole neighborhood of rich mansions, so when she gets to school it’s hard for her to make friends. She finds out that her uncle has books about things she didn’t even know were real. Faeries, magic witches?! Who is her uncle? This was just as cute as I had hoped it would be with just enough creepiness slipped in. I found this to be just what I needed because it was fast and easy to read. I have always been a fan of things that are a little creepy and spooky, so this was perfect for me. I loved the art style of this graphic novel because it focused on the cool colors. There were lots of purples and blues which made it seem quite eerie. Her parents annoy me to no end because they don’t seem to care about her. What is the point of even having a kid if you’re just going to ignore them and pretend they don’t exist? Ugh. Come on, having money is NOT that important in your life. One of my favorite scenes was when Courtney went to see her uncle after she was having nightmares and couldn’t fall asleep. It was the first time that you saw an emotion from him and I thought it was really cute because he walked her back to her room. Aww. That’s so cute. One thing that made me laugh was the fact that kids would randomly get eaten by things that were just chilling in the forest, but nothing gets said about them again. Like okay, this kid was just eaten by a monster, but no worries they’re probably fine…. Right. I THINK I’M GETTING OUT OF MY READING SLUMP YAYAYYAYAYAYY! Mythological monsters and the gods of Mount Olympus seem to be walking out of the pages of twelve-year-old Percy Jackson’s textbooks and into his life. And worse, Zeus’s master lightning bolt has been stolen, and Percy is the prime suspect. Now, he and his friends have just ten days to find and return Zeus’s stolen property and bring peace to a warring Mount Olympus. I picked this up because I was in the mood for something light and short, and it did not disappoint! I love the Percy Jackson and the Olympians books, and this was just a graphic novel version of the first book. I feel like this graphic novel was more based on the movie than on the actual book. It seemed to me like some of the plot points were different than the book, but I also did read that book a long time ago. 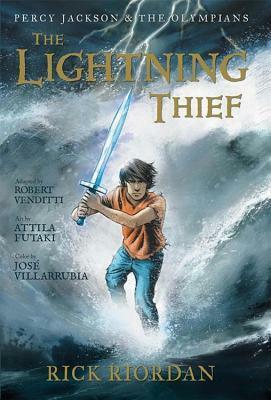 This graphic novel followed Percy, Annabeth, and Grover through their quest to retrieve Zeus’ lighting bolt from the Underworld. It happened similarly to how it happened in the original book, but was made more brief, as it was a concise version of the story. I look forward to reading the second one of this series because I got it from the public library at the same time as this one! I think it will be interesting, because Sea of Monsters is one of my favorites of the series as a whole. I love getting back into this world that Rick Riordan has created, and I’ve missed his easy-going writing style. I would recommend this to middle-school aged kids. 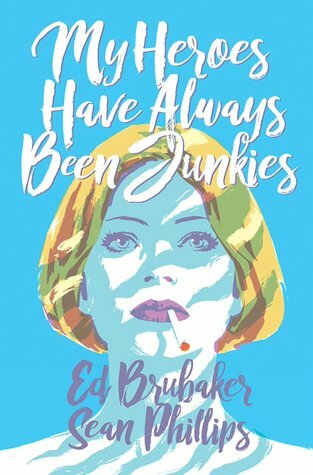 I think that it would be interesting to read this graphic novel right after finishing the first book, and comparing it. I feel as though it would be an interesting way to take in the story. The characters also did not look like sixth graders, but that’s just me. They looked hecking old, but whatever. You do you, Rick Riordan.